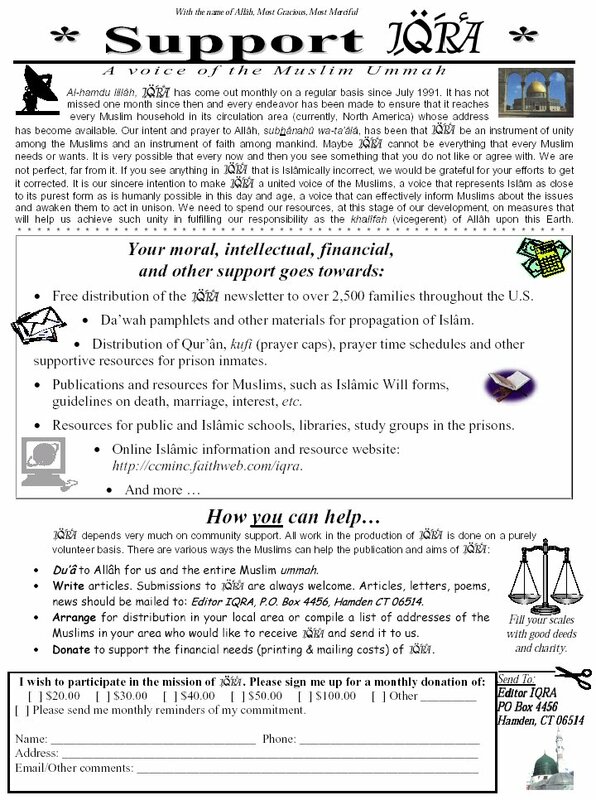 By the grace of Allah, IQRA has come to families across the U.S. free of charge every month for over 10 years and will continue to do so, insha-Allah. This is made possible through Allah's Mercy only and because of the support we receive from brothers and sisters like yourself. We need your help in all forms. Every dollar that you send us will make it possible for a few more families to receive IQRA by mail. We ask for your much needed assistance, no matter how small. Fill your scales with good deeds and charity. For your free subscription to IQRA, click here. View a printable version of the notice below, click here [Adobe Acrobat Reader required].